Crom! This inaugural volume ushers in Marvel's line of definitive Savage Sword of Conan collections. 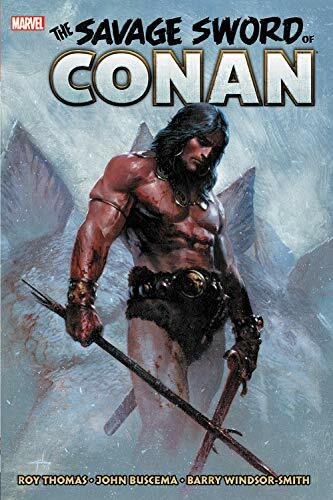 Full-color covers, letters pages, pinups, extensive articles and reviews on Conan, his world and his creator -everything's included just as no one is spared the vengeance of Conan! After the breakout success of Conan's color comic, Marvel brought the legendary sword-and-sorcery saga of Robert E. Howard's hero to its black-and-white magazine line. In lushly illustrated novel-length adventures with all the drama, violence and allure the comic book medium can off er, writer Roy Thomas and Marvel's greatest artists craft a host of Conan classics like Barry Windsor-Smith's "Red Nails" and John Buscema's "Black Colossus" and "A Witch Shall Be Born" featuring the infamous Tree of Death are just the beginning! Conan was Marvel best.Sorry if Wizard totally ignored it.